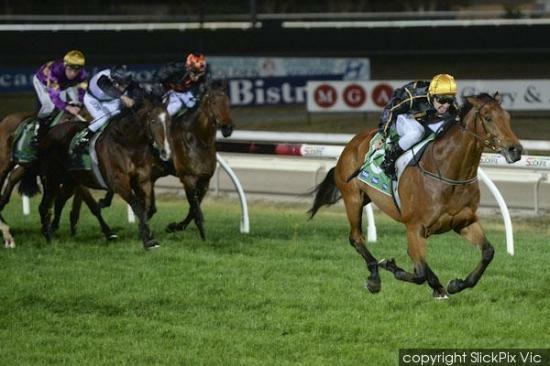 In was a significant win on Friday night under lights at Cranbourne for the Trotter stable with the very progressive galloper Plot The Course surging away for an emphatic 5 lengths victory fresh up over 1400m. It marked a return to Cranbourne for Michael Trotter after a successful stint at Ultra Thoroughbreds where he was able to train at a handy strike rate of 13% with only a limited amount of runners. Now free to concentrate on training racehorses Michael has always had a good opinion of the lightly raced son of Henrythenavigator and Plot The Course was the stables first runner since the move back. Expected to run well he was given a first class ride by Mark Pegus who was able to give him a nice run midfield the fence before angling out prior to straightening ensuring clear galloping room in the straight. Plot The Course joined in and went on to score a very dominant victory. It was a fantastic result for his loyal patient owners that have allowed the stable to give him plenty of time to mature and have been rewarded with 2 wins in only 5 starts by a total of 10.5 lengths. Plot The Course will most likely head to a Benchmark 70 1600m race on Bendigo Cup Day and while it is hard to imagine he still has plenty of improvement to come.